See the exquisite Marlborough Sounds from the water during a full-day adventure by sea kayak. 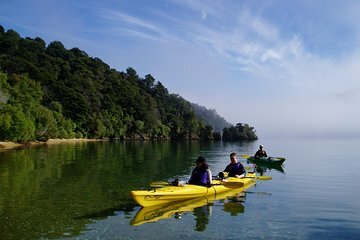 Depart from the Picton waterfront and prepare to be wowed as you paddle past secluded coves along the western end of Queen Charlotte Sound. Your knowledgeable guide points out marine life such as eagles rays, cormorants, little blue penguins, New Zealand fur seals and more. Stop at a sheltered beach for a delicious lunch with locally sourced ingredients. Numbers are limited to ensure a small-group experience.